Needless to say, game playing has taken a real back seat. I've kept up with some of the news, particularly the Wildstar F2P Beta. For some strange reason I never removed Wildstar from the main computer, even though I only tried out the original Beta. Perhaps it was me being cynical, but I figured that eventually the game would go F2P --after all, every other game not named EVE or WoW*** has-- so why not wait it out? For the record, I still have WoW files on my PC as well, and I do have a free DVD of RIFT lying around (courtesy of a Gen Con 2011 freebie), so I'm good there too. While I haven't received a Wildstar Beta pass (yet), I'm definitely curious about how it has matured. If there's one thing that I've learned over the years of playing MMOs, it's that MMOs at launch aren't the same as they are a year or so in. The most famous example is Marvel Heroes 2015, which had a terrible launch, yet the dev staff worked tirelessly to completely revamp the game into its current incarnation. SWTOR is another game that really suffered from overinflated expectations, and when the game failed to deliver on being the WoW killer that EA promoted it as, subscribers abandoned it in droves. Like it or not, SWTOR has found its niche in the F2P realm. A steady amount of updates have also rounded the game into a form now that people were hoping it'd be at launch: robust starfighter PvP, player housing, plenty of Ops and Flashpoints to run, and a lot of story to cover. Wildstar should be no different. Aside from Wildstar, I've been only puttering around on SWTOR, avoiding making a decision on what to do about my Agent. The completionist in me wants to go and do the Agent's story, but the moralist in me says "No way." I'm not exactly sure how this battle will get resolved, but my money is that the completionist will eventually win out. The mini-Reds, on the other hand, are still following the server shutdowns on LOTRO very closely, because they want their toons (and Kinship) to end up in the right server. Not sure how it'll end up there, but I know they're definitely going to keep up playing the game. **Music isn't the only major she's interested in, but it's the one with the most restrictions. I'm quite surprised that some universities, such as Marquette University, don't even have a Music degree. (You can minor in Music at Marquette, however.) Other universities have had news reports about cuts to the arts programs or facilities (such as at the University of Akron). And finally, oboists on staff are much rarer than flutists or trumpeters. ***I don't count the WoW token as F2P, even though people who play the economic game certainly think it that way. That's mainly because somebody had to pay for that token, even if it wasn't you, so technically it's more akin to "F2P only for the people who can afford the in-game token". Due to EU rules, apparently Blogger has automatically posted a warning saying that Google Analytics and whatnot is being used on blogspot.com blogs, visible by viewers that originate from the EU. It also says that it's up to me to determine if that warning (or whatever it is) is visible, a snarky way of Google being able to claim plausible deniability if something goes wrong and someone decides to sue Google for something that I wrote (or, likely, some malware that snuck onto the blog). Anyway, if someone who originates from the EU (you know who you are) can comment as to whether this sort of warning/announcement/whatever shows up, I'd appreciate it. I don't feel like trying to cause security alerts by attempting to IP spoof my laptop just to find out if the damn thing is there or not. No, we didn't use a ship to get there. 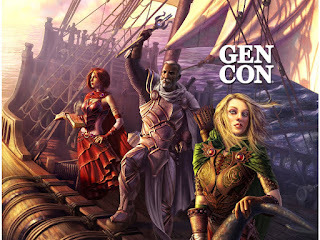 From the official Gen Con graphic for 2015. Due to circumstances beyond our control*, we made our annual trek to GenCon on Saturday instead of Sunday. It was a (relatively) cool and clear day when we arrived at Indianapolis and walked from the Lucas Oil Stadium parking lot to the convention center. The line for coffee at a nearby coffee shop was practically out the door, and we arrived too late to get a drink from Mayfair's free coffee van out front, so we went inside to get our tickets from Will Call. There, we were confronted with the first big difference between Saturday and Sunday at Gen Con: the Will Call line was 1/2 hour long. On Sunday, you could just walk right up without a wait and get your tickets, but a lot of people show up for Saturday and Sunday only, so the line is significantly longer. Once we secured our passes, the mini-Reds took off with my brother-in-law for points unknown, and my wife and I were left to explore the Exhibit Hall on our own. So, the new WoW expac is called Legion, and will focus on the Burning Legion's massive invasion of Azeroth. Why didn't they do this instead of Warlords of Draenor? It would have made a LOT more sense to tinker with a few things and keep a normal timeline rather than going Azeroth-2 like they did with Warlords. As it is, I do see that Blizzard seems to have finally gotten a kick in the pants as far as putting the story in-game as opposed to in books and other media. Still, the damage there has been done. They can't put old story back into the game, and since they're not interested in fixing the previous storylines it's kind of a moot point. But I am still shaking my head, wondering at the change of venue for the presentation. Blizzard has always done their own thing, and their customers have loved them for it. Why decide to abandon their current business model now? Perhaps there's more to the subscriber drop than Blizzard is letting on, but what I think is more likely is that the rest of the industry is threatening to pass Blizzard by. Blizzard finds itself in an unusual position with MOBAs in having to play catch-up, and they can't seem to get that mojo back in holding onto their WoW subscriber base. On the Activision side of things there's Skylanders, but Disney is muscling into that space with their own version*. I get the feeling that Activision/Blizzard sees the other game houses as more of a threat than before, and to stay relevant they can no longer afford to isolate themselves from the rest of the gaming populace. *And they've got the Marvel and Star Wars properties to attract buyers of Disney Infinity as well. 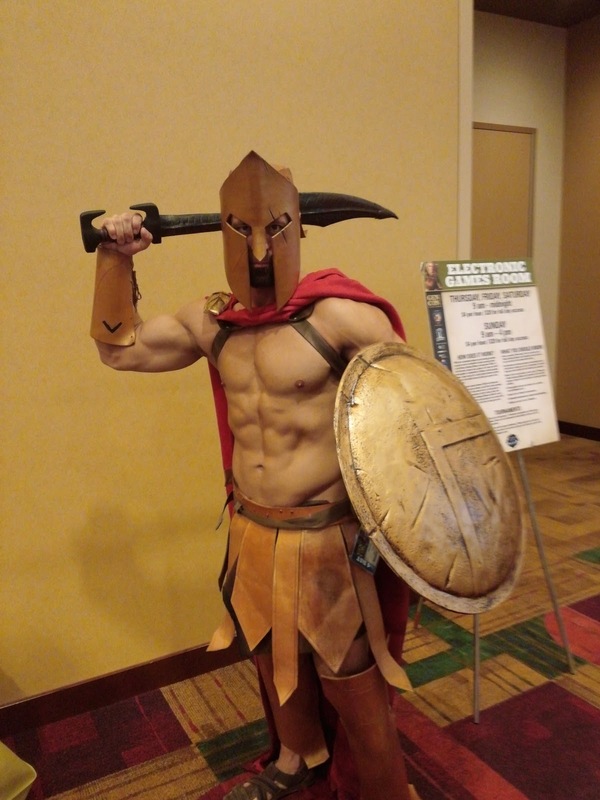 Gen Con 2015 has come and gone, and all I've got left are the memories. The only thing that was fake was the spray tan. That was NOT a body suit. And, naturally, I drew a blank at the name. 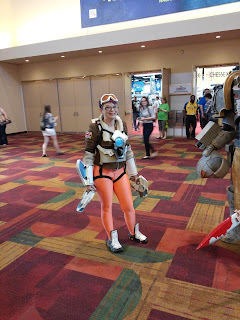 "You're that... that Brit woman from the new Blizzard game!" 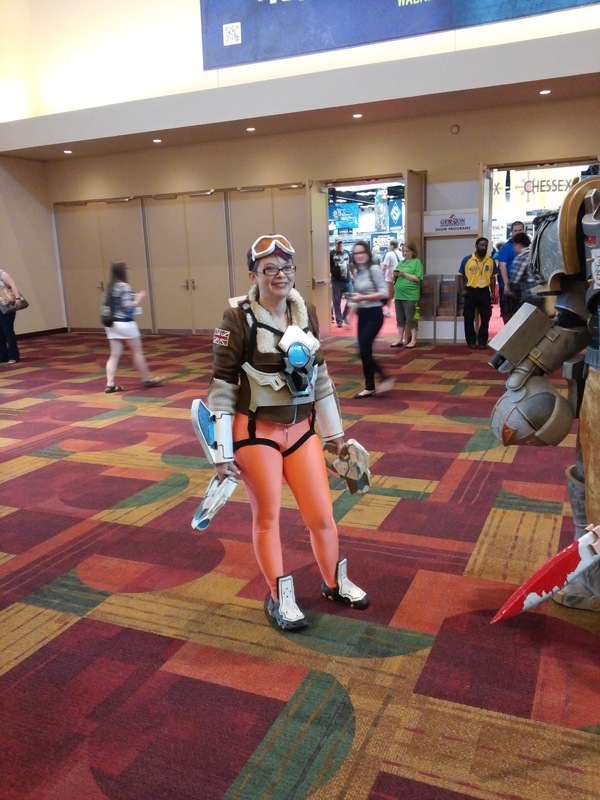 I was grateful she was excited I knew she was Tracer from Overwatch.